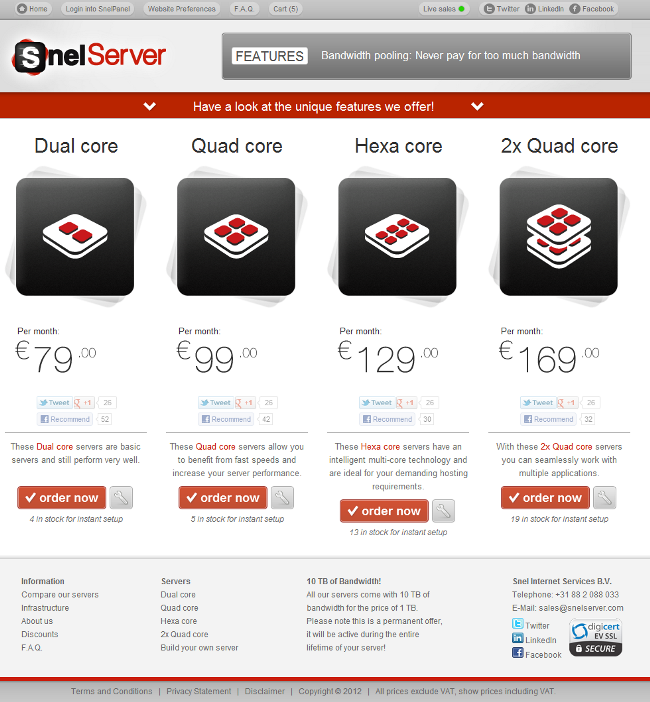 SnelServer.com is proud to introduce its newly redesigned website. Following the feedback from our customers and online marketing advisors we have decided to give our website a brand new look. Our new website has a fresh appearance and is easier to navigate. We know that our customers prefer simplicity which is why our website is still very simple and clean with more user-friendly features. We have created new menu items which allow you to find any information you need about our company, products and services. We still have the same drop and drag and simple upgrade configuration tools which are redesigned to provide you even more ease of use than before. Moreover, we have also created a new blog page, to share our thoughts and advice about trending topics in the hosting industry. Hence, we recommend you to keep an eye on our blog page regularly. Since we are interested in hearing what our customers think about us and what their experience is with SnelServer.com, we have also created a customer review page which allows you to add your review and share your experiences with us. This new version of our website is just a start; we will add more content pages and functionalities over the coming months. We aim to provide you more simplicity, ease of use and the best product information. We are excited to launch our new website and we hope you will be provided from all the information and functionalities you need. To see the adjustments and changes we have made, you can take a look at the screenshot of our old website below. Simple, fast and reliable hosting in a matter of minutes! The Dedicated servers with Instant Setup offered by SnelServer provide high performance hosting solutions within a few minutes. Due to the fact that our Dedicated servers come with Instant Setup there is no need to wait hours or even days to host your IT environment. Our starting point is to provide simple, fast and reliable Dedicated Servers to meet your business requirements perfectly. Our affordable Dedicated servers not only enable you to save time and money but it also provides freedom to manage your server independently. To provide more flexibility and convenience we offer a Free Dedicated KVM which allows you to control your server remotely at bios level 24/7. SnelServer requires no contracts because we are confident that you will enjoy our flexible, fast and high performance servers which are completely dedicated to your needs.